The hospital is quite far from our home, but a wonderful private driver, Maurizio, who first took us from FCO airport to our new apartment last May, agreed to do the honors and drive us to the clinic — and home again at night. It’s about 18 miles (28.8km) one way. That is not far by American standards, but it is quite far by Roman standards, nearly to the beach at Ostia. In late morning traffic it took us an hour. It’s possible to go by public transportation, but as this was not to be a day at the beach, a private driver (autista private) it was. In the U.S. we’d arrive before dawn, having fasted the night before, which I did. My doctor said I could arrive at the luxuriously late hour of 11:00AM because my blood panel had been done prior. And I goaded him into letting me have my caffè (or two) as the anesthetic would be only local with an optional sedative. I was opting out of the sedative (I hate that out of control feeling), so caffè va bene. Nurse in Italian: Change into pajamas and wait here. Rest. Me in Italian : What pajamas? Nurse in Italian: Your pajamas. Me in Italian: Then what? This experience certainly stretched my Italian skills. There is a game called: Is-My-English-Worse-Than-Your-Italian-Then-Let’s-Use-Italian-and-You-Can-Struggle. Often the Italians I encounter understand more than they speak, just as I understand more Italian than I speak. (A variation of the game is If-The -Other-Person-Doesn’t-Know-I-Speak-insert language-I Won’t-Have-To. First person to speak in the other person’s language loses. I usually lose.) Fortunately my doctor speaks English perfectly and I adore him. He lived in Houston for 3 years and taught at UT Medical School. He’s fabulous! But he was not there for all the pre-op procedures, so there were some “Moments In Communication.” A cardiologist came in to interview me and we had some amusing misunderstandings. There were some funny questions. Why on earth would a cardio need to know when I started il ciclo mestruale? I am frickin’ almost 60 years old! What happened at 12 or 13 seems irrelevant at least to me. Also, what do I eat? Did she mean today? Yesterday? No always, every day, what do you eat? Should have brought my weekly menu plan. Ric managed to mention vino and caffè. She spoke about 3 words of English, one of which was “pee pee.” However, la dotteressa cardiologa redeemed herself when she asked my current age, was surprised, and told me I carried my years well. God bless her! The procedure was fine if extensive. Under considerable pressure from the surgeon and the anesthesiologist, I did accept un po’ del sedativo, but remained awake the whole time, listening to the banter of the 30 or so people in the operating room. (OK, not really 30, but Lord, there were a lot of people about for my “minor” intervento!) I was able to respond, comment, and even laugh a little. The team was very attentive and efficient. But when they took me back to my room, the two male nurses kicked Ric out and simply ripped the flimsy paper gown off me, slapping ECG leads on my naked self, which was made all the more amusing by the fact that my legs are bandaged from my feet to 3 inches below my groin. When one of them tried to help me back into my pajamas like one would with a two-year-old, my Type-A-self kicked in. “Faccio io!” (I’ll do it myself!) They backed off. Two hours after the procedure, I was cleared for take-off, and the charming Maurizio was there to whisk us home through evening traffic. Yup, another hour. I’ll close by saying, it’s a damn good thing I brought pajamas with me. This is my view the morning after while laying in the recliner. At least I have pretty toes. The bandages go all the way up. All the way. 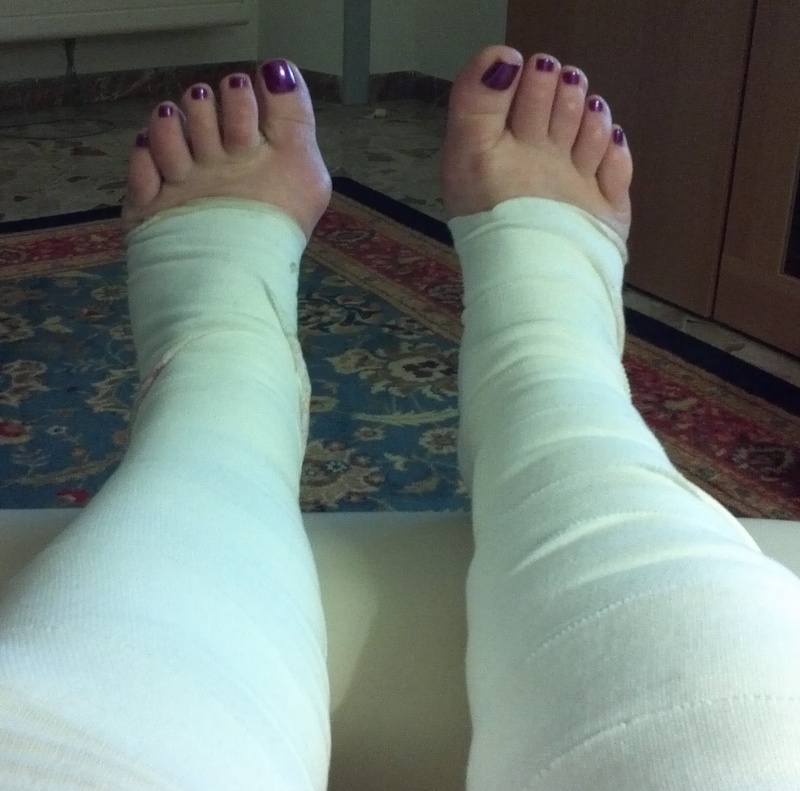 They come off Wednesday and I will have new legs and be able to roam in Rome once again. So glad everything went well with your surgery! Wishing you a speedy recovery so you can get out and about in the streets of Rome. Looks like you got “toe-bama-care” with those ten little piggys – tooo cute! I do love your posts and I agree with everyone that you are a gifted writer…reminiscent of Erma Bombeck! Oh Laurel…I really do think you missed your call, there’s a journalist inside you! “Amusing” would be an understatement for your account! We’re thankful all went well and are praying for a quick recovery. BTW, I too inherited vv. The Mummies wife speaks! I’m jiggy with the toes though! So will you be trick or treating this year…LOL. The orderlies must of been ugly for you to NOT let them help with you jammies! Hope you are doing better. Say yo to Ric. Doing well, but no T or T for me. They don’t do that here anyway, although there’s a party at the Embassy for employees’ kids. That was last night for convenience. We get a holiday this week, though: Thursday is all Saints Day and everyone is off. Big religious day. I love the fall holiday season! There are three in November alone! Thanks Anita! Glad I had my toes done because clearly that is off the agenda for awhile now…. Looking forward to the Marine Corps Birthday Ball on Nov 10. My floorlength dress will cover the evidence. 🙂 Say hi to the boss. Semper Fi! with what I think of as the Italian sense of style. But maybe this is from the Spring 2012 collection. Versace? A fun read, and I’m glad your recovery is going well. You have a really engaging writing style … maybe there’s a book on your horizon? Thanks Will. I had to “lay it all out” the way I experienced it. Not too many photo ops, though, this time. See you soon!!! Hi to *your* Rick, too! Terah took the words right out of my mouth. 100% of what I was thinking. And the first thing I noticed were your beautiful toes. I loved your pre blog and have been looking forward to this one. You didn’t disappoint me, you brought smiles to my face. Hope those legs heal fast so you can get back to exploring Italy.